Infinite Art Tournament: Element of the Month: Niobium! Don't feel bad that you don't know much about Tantalum; it took the world's chemists more than half a century to figure out what was up with this rare metal. The problem was that it only occurs naturally along with its sister element, Niobium, and people had a hell of a time deciding whether they were both the same thing, or different, or if there were three or even four different elements present in their mineral forms. It wasn't until the time of the U.S. Civil War that it all got sorted out, and chemists who had made their reputations by discovering Columbium and Ilmenium presumably slunk off humiliated into the footnotes when it became awkwardly clear that these elements didn't exist after all. It was actually the German chemist Heinrich Rose who can take the credit for establishing that Niobium was a distinct element all by itself. He did this in 1846, shortly after publishing his discovery of the element Pelopium. You have never heard of Pelopium because it turned out to be just a mixture of Niobium and Tantalum. So obviously these were tricky tricky elements to get straight, and hell, if Heinrich Rose could bat .500 in the major leagues he'd be the stuff of legend, so let's go easy on the poor guy. What do humans use Niobium for? Well, you can put a tiny bit of it in your steel alloy and add a lot of strength to it. How does that work? I dunno. You'd have to ask a metalurgist. Niobium also has a very high melting point (check it out! ), is very resistant to corrosion, and "exhibits superconductivity properties," and these things all make it sometimes very useful to folks who make specialized stuff out of metals. In the Earth's crust, there's around 20 parts per million of Niobium, making it the 33rd most common element among us. There's a school of thought that this is less Niobium than you would expect on a planet like ours, so there must be lots of it in the Earth's interior. I am really in no position to say. 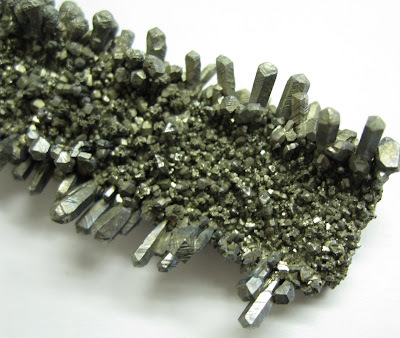 Like Tantalum, Niobium has its market pretty well cornered by the Brazilians and the Canadians, although there are plenty of other countries with deposits if those two every get sick of the business. Says here that the Chinese, who use about a third of the world output, are helping Malawi set up in Niobium mining; that suggests to this analyst that we may be looking towards a moderate drop in price in the mid- to long-term. My quest for a Niobium image led me to a wicked cool woodcut which in turn led me to The Periodic Table Printmaking Project. I think you'll like it. That is some pretty art you just stumbled across there. Very nice indeed. oh, i LOVE that periodic table!